Alpharetta, Ga is one of the more newly renovated suburbs you will find anywhere, not just in Georgia. Alpharetta is truly a keystone for good living and good people, and you don’t need to spend much time there to realize it. The city has set a standard for which other communities, suburbs and cities of Georgia can model themselves after. Alpharetta is also extremely unique! In fact it has 57,000 residents, but during the day, because of all the businesses there, the population amplifies to over 120,000! Now that’s a lot of people, which mean a lot of business to cover. 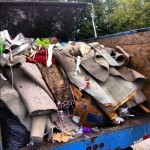 No worries, The Stand Up Guys Junk Removal Crew handles it all! There isn’t a single part of Alpharetta that we don’t cover. The Stand Up Guys range from the out skirts of Milton, all the way down through Crabapple, and everywhere in between. 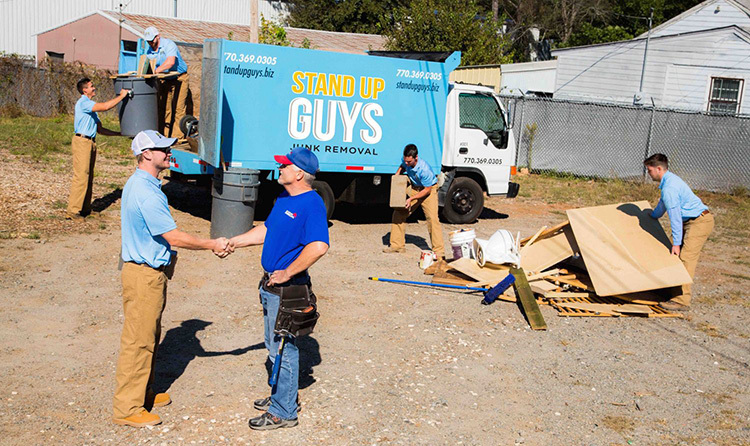 Over the years The Stand Up Guys Junk Removal Crew has earned a stellar rapport with the residents and businesses of Alpharetta. We’ve earned this reputation with Alpharetta for many reasons, one being that our customers and their needs ALWAYS come first. 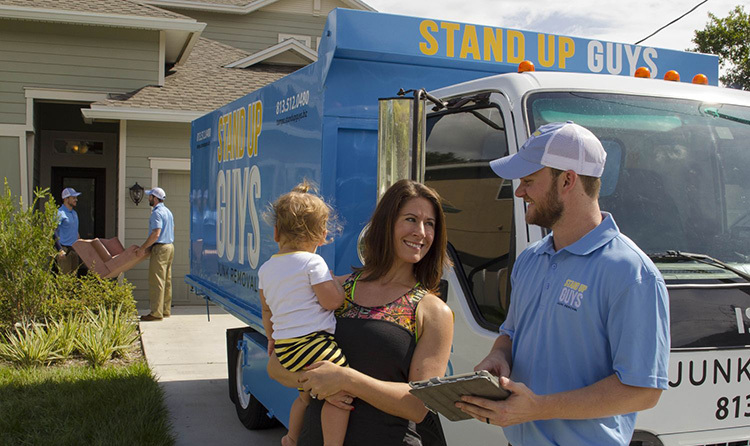 At Stand Up Guys we go out of our way to make sure all customers are 100% satisfied with their service every time. Making people happy, junk-free and stress-free is just part of what we do! 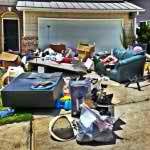 Stand Up Guys Junk Removal is Alpharetta‘s main source for all its rubbish, trash & yard debris removal needs, both residential and commercial. One of Stand Up Guys Junk Removal Regional Managers actually resides in Alpharetta (so you know we have a soft spot for it)! Alpharetta is also known for its extensive acreage, gorgeous homes and wonderful polite residents. The Stand Up Guys respect that and treat all our customers, homes, properties and families with the utmost respect and the most outstanding customer service you can find. That’s just one of the main reasons why our reputation in the community is so polished. Stand Up Guys have been a staple of the Alpharetta community for more than a decade. We love our city and the people that call it home. Another reason why The Stand Up Guys have become such a staple in the community is because of what we do with our customers items once we leave. 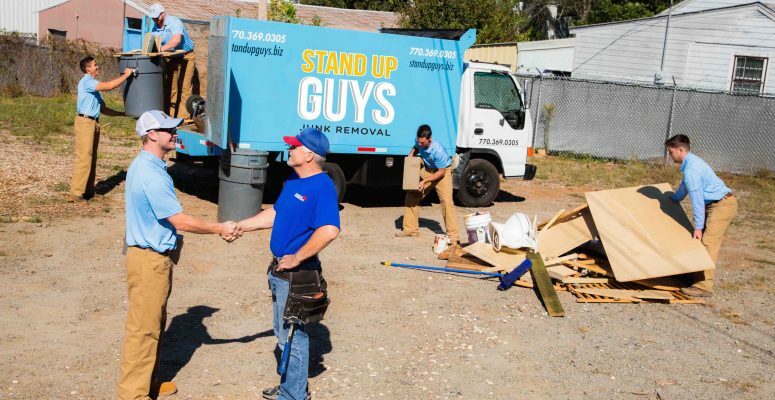 The Stand Up Guys Junk Removal Crew donate and recycle over 60% of the items we remove. We donate these items back into the community of Alpharetta, like old furniture, appliances, and even electronics. 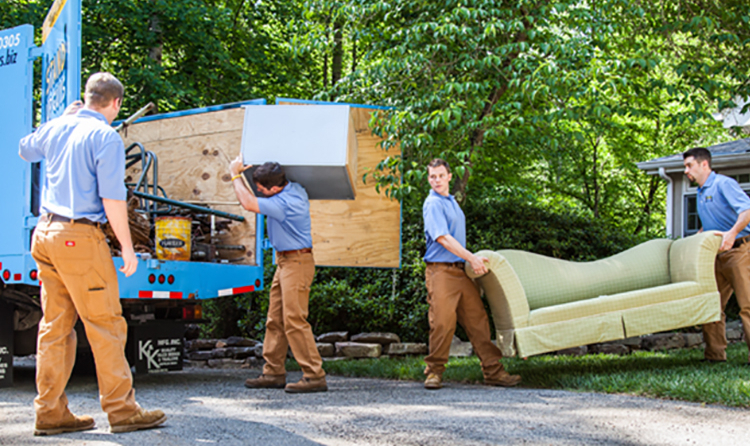 We believe that we can always find a second home to the things we remove. Fun Fact – In 2009 Forbes Rated Alpharetta Number 1 in “reloville”. It’s also is the home of Carson Gibson, Stand Up Guys Regional Manager. Check out the Regional Manager in Your Area. Regional Manager.